Lemon rice recipe with step by step photos. 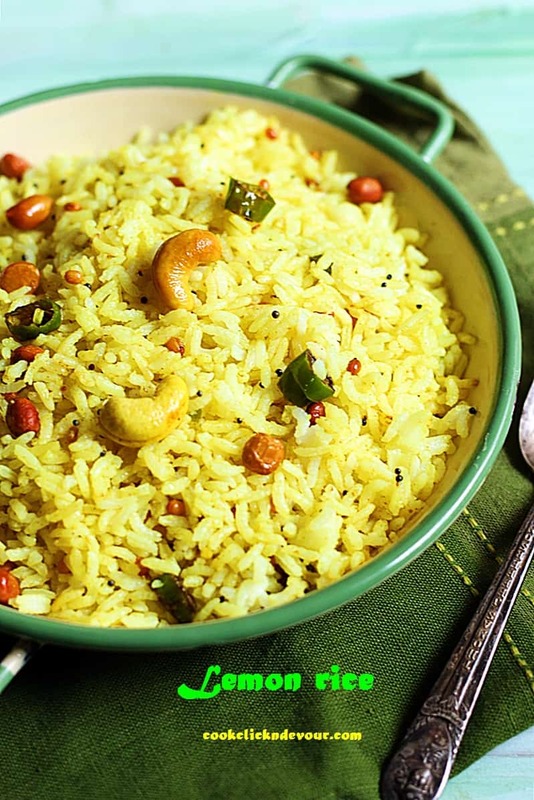 Sharing the recipe for the most commonly made easy south Indian rice dish. Lemon rice is one of the most popular rice recipe from south India. it is super quick fix meal with in 10 minutes flat. This is also a rice recipe popular in restaurants, mess. Lemon rice is also served as prasadam in south Indian temples. Lemon rice is usually eaten alone or with some chips. This easy rice recipe also tastes very good with spicy potato fry, raw banana fry. This rice is also a part of Tambram wedding meals. This lemon rice is the easiest rice dish that you can make. Especially if you have cooked rice or left over rice handy making lemon rice takes 5 minutes only. With no chopping involved this is the best lemon rice recipe to make when you are in short of time. If you want to pack something quick in lunchbox then lemon rice is the best bet. Making lemon rice is a two step recipe. Cook and cool the rice. next is to make a tempering with mustard, urad dal, chada dal, peanuts, cashews and add lemon to it. Mix with rice and serve. Peanuts add a crunchy taste to this sour and flavorful rice. Cashews also go very well this rice. I prefer to use coconut oil or gingely oil for lemon rice. Somehow olive oil does not suit well for lemon rice. But if you want to use olive make sure to use extra light olive oil. To make lemon rice recipe I always use ponni or sona masuri raw rice. basmati rice is not used for lemon rice. Cook the rice and cool it thoroughly before making lemon rice. You can make this ricer ahead and serve too. Stays good for around 8 hours. Serve lemon rice with potato chips, raw banana chips, potato fry, vendakkai poriyal. If you are looking for more rice recipes do check tomato rice, easy veg fried rice, veg pulao recipes. How to make lemon rice recipe with step by step photos. Cook and cool the rice thoroughly. Add 2 teaspoons oil, required salt and mix well. Set aside. Heat 2 teaspoons oil in a pan. Temper with mustard seeds, urad dal, chana dal and asafoetida. Add curry leaves, minced ginger, chopped green chilies, cashews and peanuts. Also add turmeric powder. Saute well till cashews turn golden. Remove from flame and let cool for 2-3 minutes. Add this to the cooled rice and mix well. Serve lemon rice with chips or pickle. Lemon rice recipe with step wise photos. Quick and easy south Indian lemon rice recipe in 10 minutes! My all time favorite comfort food. Lovely pics. Can I use olive oil in lemon rice recipe? wow easy and tasty lemon rice, looks perfect.